Two of the greatest experiments started when I was very young. These being the launch of four probes. The two pioneers and the two voyagers. These probes have produced some of the best images of our galaxy we have ever seen. Spend a while going through the images over on the NASA website. I don’t remember the launch of the pioneers in 1972 and 1973. I was a little too young to understand most things. With the help of scientist educator, Carl Sagan managed to persuade NASA to insert a “cosmic greetings card” to the spacecraft. 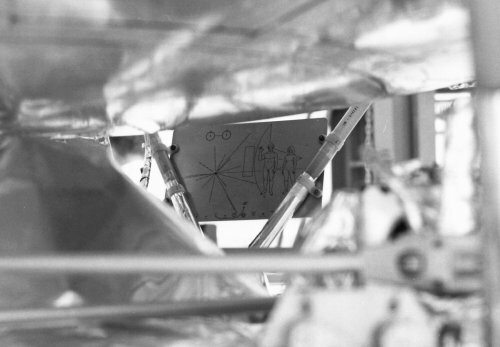 This became known as, a bit unimaginatively, the Pioneer Plaque. Information describing what we look like and where we are in the universe. A simple & beautiful way of saying hi to the universe. The plaque wasn’t without controversy. The male and female are both naked. Some people have said that the woman is subservient. They get that from the reason that only the male figure has his hand raised “in greeting”. That was done on purpose, so not to confuse whoever found the plaque. It only shows one figure with a raised arm, that was done so not to give the impression that humans have a permanently raised arm. We now have to jump forward four years to 1977 and the launch of, arguably, the most famous of all space probes. Voyager 1 & 2. The first man made objects to leave the solar system, or not as nobody has come to a final conclusion over this! These two,still functioning, probes have another gift to any alien race who finds them drifting in interstellar space. 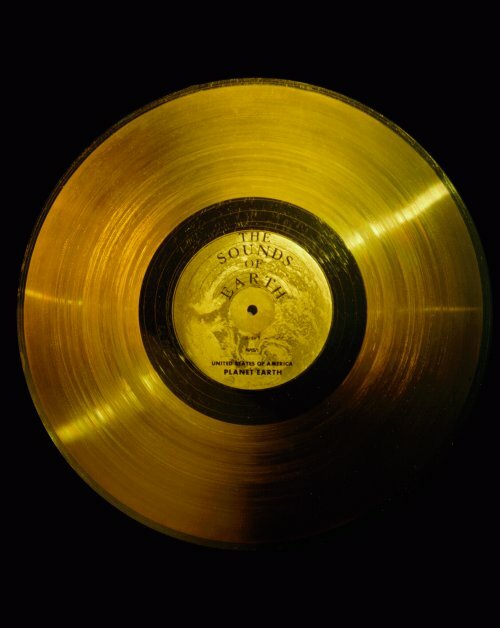 A golden record. An audio and visual record of earth. From greetings in 55 languages, sounds of the planet as well as classical and pop music and 116 images. All stored on a gold plated aluminium disc. 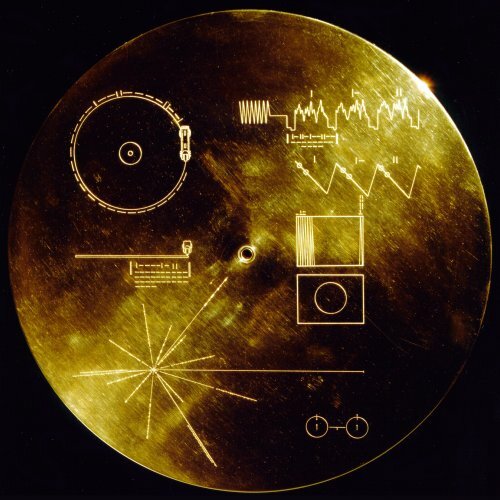 The disc was originally rejected as it contained the phase “To the makers of music – all worlds, all time” hand etched in the takeout grooves, the area between the playable area and the label. The reason given was very NASA. It was rejected because this inscription “wasn’t in the specification”. Sagan persuaded the administration to leave it there and fly the disc as is. A nice piece of spontaneity from the person who was cutting the disk. Nick Sagan, Carl’s son, voice appears on the disc. He was 6 at the time and has the most memorable piece on the disc. The greeting in English. “Hello from the children of planet earth”. The greetings are not all like that. Some do make you smile and others make you wonder why they selected that one! The record contains instructions on its protective cover as well as, like pioneer did before, a location of the planet of origin. This tradition has been continued to this day. 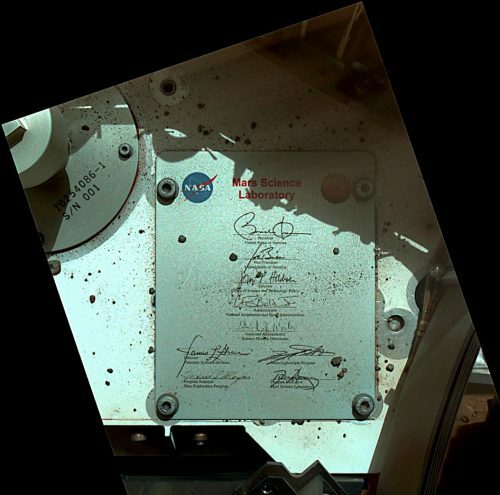 The Mars rovers have a plaque of greeting. The next generation of the pioneer and voyager probes are launched, I just hope they contain the same “cosmic time capsules” that their ancestors took with them to the stars. Hopefully, it will be like the originals and not a wafer of silicon that will cause more confusion than a disc and stylus.